While OA19 endures as a land entity into and throughout the mid-Roman period, some change is wrought to its interior (Figure 151). 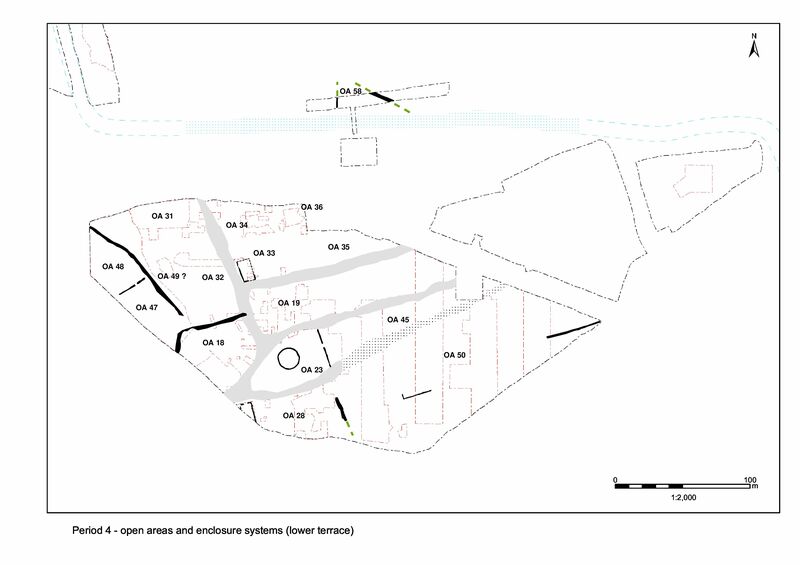 At its west end, the gravel surfacing of the enclosure interior is renewed and the centrally positioned well that was introduced late in Period 3 eventually declines and passes out of use in Period 4. This surely marks a change in function, as does the imposition of new buildings and the incursion of distinctive rectilinear pits that generally contain larger basic assemblages (pottery, tile, bone, etc. ), more diverse metalwork and jet/shale objects. Initially, most of the Period 3 surfacing across the west end of OA19 seems to continue in use. The stratigraphically earliest resurfacing in Period 4 is represented by gravel layers 6234 and 6647 (Groups 515, 537). Though these surfaces are likely to be laid down during the late 2nd to early 3rd centuries AD, the dating is confused and may be influenced by later activity. Some parts of the Period 3 surfacing may persist. 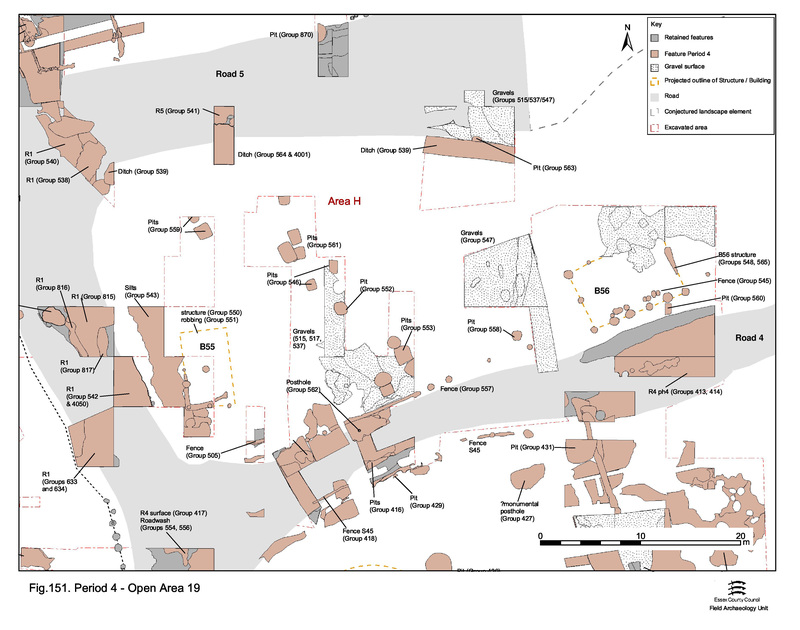 More concerted resurfacing (Group 547) of the OA19 interior comprises gravel surfaces (6084, 6089, 6218, 6145, 6320, 6654), laid on foundation deposits of gravelly or pebbly sandy silt (6181, 16332, 6316, 6348, 6352, 6584, 6655), which represent the re-laying and maintenance of this open area - perhaps as a consequence of the Period 3 elliptical sub-enclosure passing out of use. Some surfaces show evidence of repair (6177, 6185, 6319, 6763, 16342), and some are overlain by silty accumulations (6173, 6715, 16257, 16284, 16288, 16289), which may relate to the use of the surface. Most of the surfaces seem to be degraded but some are notable for the incorporation of animal bone (chiefly cattle scapula and mandible) in their construction. As a presumably deliberate inclusion, such occurrences are worthy of further consideration. Wear hollows 16204 and 16342 are filled with selected bone packed in gravel but little else. On the whole, these gravel surfaces contain significantly more finds than earlier surfacing deposits in OA19; the incidence of coins is particularly noted. However, this may merely be a product of increased material culture and surface rubbish, resulting in increased incorporation of such material at the time of construction. Further accumulated silts are evident along the roadsides, notably at the junction of Road 1 with Road 4 where several layers of runoff silts build up (6142, 6326, 6331, 6334, 6340, Group 543). As with other Period 4 roadside accumulations, these layers do not seem to be the product of deliberate dumping or middening along the roadsides. It would seem that although Roads 1 and 4 continue in use, they are no longer actively maintained much beyond the early 3rd century AD. Further accumulated silts (6072, 6088, 6098, 6103, 6106, 6121, 6122, 6123, Group 556; 6096, 6097, Group 555; 6105, 6114, Group 554) are present along the western part of the Road 4 edge where investigated within Excavation Area H. These layers, probably form through the use of, and wash-off from, the roads, and build up alongside, and gradually encroach upon, the road surfaces. These accumulations contain moderate finds assemblages, predominantly animal bone and tile, but with a significant ironwork component. 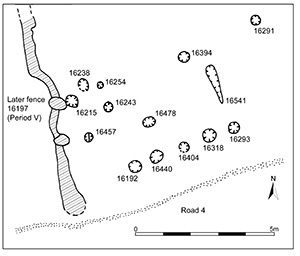 Period 3 use of well 6280 (Group 531) appears only to be represented by fill 16131, with overlying fill 16083 being a rapidly accumulated organic/peaty deposit containing large amounts of animal bone, much of it evidently butchered (see 'Road 2'). This same fill contains wooden objects SFs 5667 and 7185 ), many fragments of shoe leather (see Footwear, nos 503-16), rope (SF5484) and a number of near-complete ceramic vessels that account for two-thirds of the pottery group by weight, as well as a mass of debris such as twigs and leaves. However, the relative lack of tile (only 3kg) and virtual absence of metalwork are perhaps significant - does fill 16083 represent a specific dump of organic rubbish and pottery or even a structured deposit? It contains KPG26 which is dated c. AD 190-200. Overlying fill 16084 contains three loose planks lying at inclined angles where they presumably became detached from the lining. Although in the vicinity of the modern water-table, and therefore in variable states of decay along their lengths, these planks are less uniform than those in situ lower down. It is possible that the upper portion of the box lining is of differing construction or that at least some of these planks may derive from the well-head. Above, clay-rich deposit 16074 is probably an attempt to seal the top of the redundant well shaft, perhaps as part of its formal (even ritual?) closure. The silt fills above probably constitute final infilling and levelling, perhaps in response to continuing subsidence. Building 55 is constructed in the south-west corner of OA19, close to the junction of Roads 1 and 4. Its identified remains consist of right-angled foundation slot 6288/6291 (Group 550), which includes three integral post-holes (6274, 6285, 6330 Group 551) positioned at regular intervals. 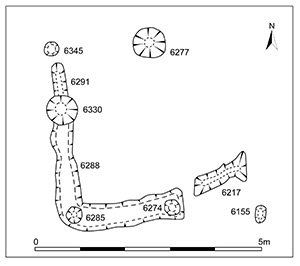 Together with further post-holes 6155, 6277 and 6345 (also Group 551), these structural features represent the apparent south-west corner of a rectilinear timber building of unknown overall dimensions (Figure 152). Alternatively, these structural fragments could represent little more than a projecting porch on the south front of a larger building, part of the south wall of which could perhaps be marked by inter-cutting slots 6443 and 6409 (Group 505) located alongside Road 4. No Period 4 pits occur in the south-west corner of the enclosure (where excavated) and may hint that the building indeed occupied a larger area. As seen elsewhere (e.g. Building 54), the foundation slot is packed with fragments of burnt clay, together with tile and flint cobbles. No internal features or surfacing are recognised. Deposits of brown silt 6212 and 6228 (Group 574) seem to build up against its walls, presumably while at least parts of it still stand. The demolition/destruction of Building 55 occurs some time during the 3rd century. The Period 5 layers and spreads of material (Group 576) that overlie its remains contain evidence of burning and quantities of tile. This material may be the product of the destruction of the building, although these deposits admittedly also contain a range of domestic rubbish. Slots 6061 (Group 557) and 6397 (Group 545) define an interrupted foundation cut that runs along the northern edge of Road 4. The whole 10m-length of slot 6061 is excavated and comprises a series of inter-connected slots of varying length and depth, though generally 0.35m wide. Neither end of slot 6397 is determined, but it is likely that its western terminus occurs in the vicinity of the junction of Roads 1 and 4. These lengths of slot are connected and are continued eastward by post-holes on the same alignment (6019, 6124, 6147, 6064, 6070, 6080, 6082, 6138, 16516, 16518, 16482, 16491, 16506, 16508, 16462). 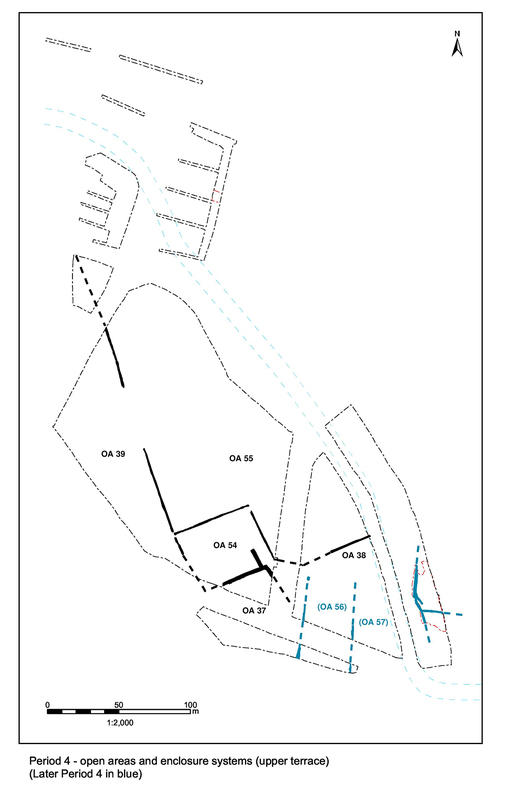 It is apparent from the pre-excavation plan that there are others, which were not investigated. This boundary can be reliably traced for a distance of over 30m alongside Road 4. 16383 Group 549 is a reuse or modification to a Group 545 post-hole. The presence of Nene Valley colour-coated and central Gaulish Rhenish wares dates a number of these features to the late 2nd and 3rd century AD. The remaining pottery is consistent with this date; gully 6061 includes a B5 dish and is possibly filled by the mid-3rd century. The presence of late shell-tempered ware within the post-pipe of 6064 is probably intrusive and unlikely to be related to the use of the feature. It is apparent that these groups represent a fenceline of some durability that probably undergoes a succession of repairs and modifications during its lifetime. Building 56 post-dates elements of the Period 4 resurfacing of the enclosure (Group 547) and comprises post-holes and a slot (Groups 548, 565) that define a rectangular structure c. 10m by 6m (Figure 153). 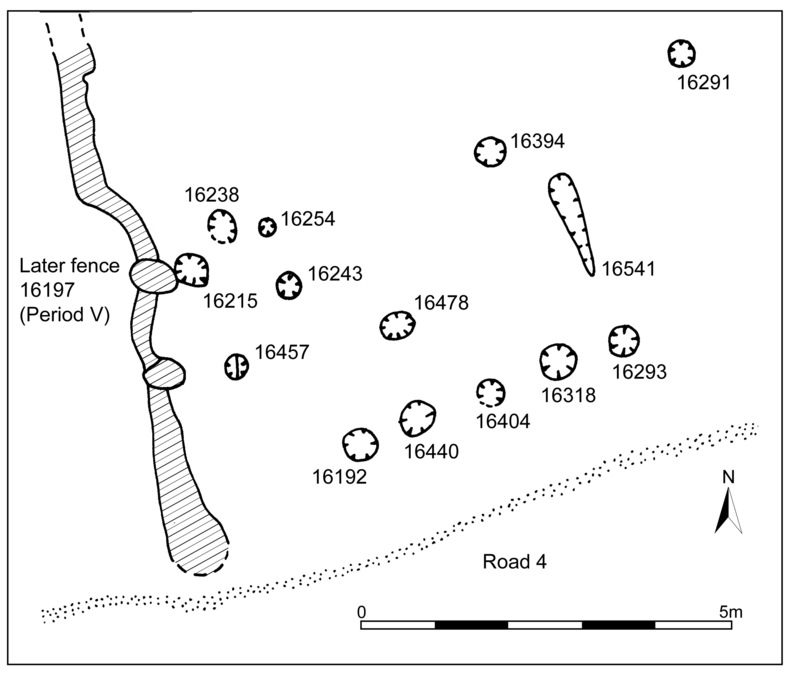 Its south wall runs along the edge of Road 4 and the building would seem to straddle the Period 4 fence-line previously described (Groups 545, 557). There is no direct stratigraphic relationship between building and fence-line, so their relative sequence is difficult to determine. The north wall is not well defined, lying as it does in an area not extensively investigated. Nearly all of the south wall post-holes are sealed below external accumulation 16187 (Group 573 Period 5), and at least some of this layer may include material from the life of the building. No internal partitions or floor surfaces are in evidence. The presence of 207 tesserae in cleaning layer 16081 (Group 8001) and a further 205 from accumulated silt 16187, which seals most of the structural elements of the building, led to speculation at the time of excavation that layers 16321, 16312, 16313 (Group 4009) represent the bedding upon which a tessellated floor may have sat. However, no tesserae were found in situ, and these layers are mostly outside the building footprint and do not appear to have contained either tesserae or mortar themselves. These miscellaneous layers are as likely related to Road 4. Along the southern side of OA19, flanking Road 4, poorly dated Roman pit 6141 (Group 544) is post-dated by the Period 4 roadside fenceline (Group 545). A similarly elongated pit, 6096 (Group 555), lies to its east. Both seem aligned along the road edge, 'outside' the fenceline. A third, rectangular, pit 16315 (Group 560) lies in a similar position further east. Only small and isolated circular pit 6040 (Group 558), of late 2nd century AD date, is positioned 'inside' (north of) the fenceline. Other than a large piece of septaria stone in 6040 and two tile tesserae in 16315, these shallow pits contain unremarkable artefact assemblages. 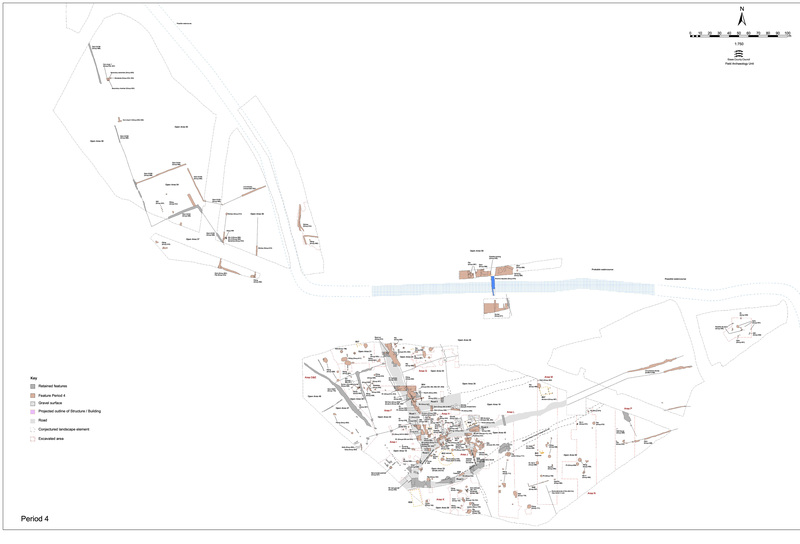 The majority of the excavated mid-Roman pits within the western part of OA19 forms two clusters; to the centre (Groups 546, 559, 561) and south (Group 553). However, these groups appear to be closely associated, all but pits 6006/6116 and 6109 (both Group 553) being rectilinear in plan. Their perceived clustering may simply be a product of the partial excavation of this vicinity. The southern group (pits 6006, 6007, 6030, 6109 and 6182 Group 553) are of moderate size, ranging from 1.2m to 1.7m diameter, though only a maximum of 0.4m deep. All but 6109 are roughly square in plan. All contain large quantities of pottery and tile, moderate amounts of animal bone and occasional items and fragments of metalwork. Pit 6006 includes a copper-alloy penannular brooch (SF484), a decorated iron stylus (SF1253) and five hobnails (SF7860). Pit 6030 contains a radiate coin (SF1670) and circular pit 6109 a total of thirty-seven tile tesserae. The central group (pits 6169, 6209, 6267, 6335, 6873, 16058, 16088 and 16149 Groups 559, 561) are located over and around the site of infilled well 6280. All are square to rectangular in plan and of uniform proportion. Furthermore, they are similarly aligned NNW-SSE, with all but pits 6335, 16088 and 16149 seemingly forming a line. Their alignment, and the location of pits 6209, 6267 and 6335 in the top of the infilled well, suggest their deliberate positioning in relation to the remains of the well. Artefact assemblages from the central pits are similar to those from the southern, with generally large quantities of pottery, tile and animal bone. Pit 6169 is notable for the iron ring (SF1663), nails and waste piece accompanying coin SF1645 within it. 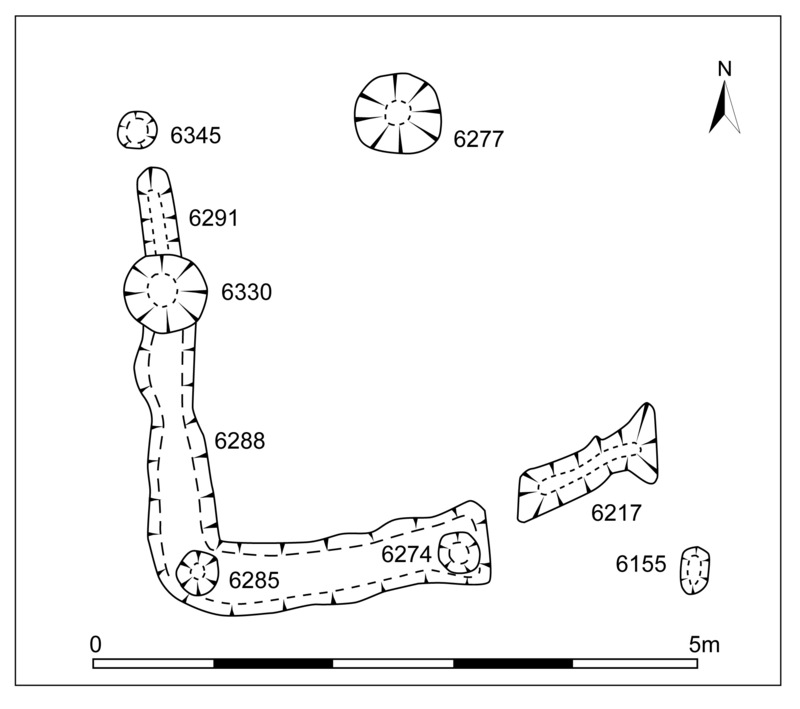 Pit 6209 contains a copper-alloy hairpin (SF1682) and Lamberton Moor brooch (SF2321). Pit 6873 contains a shale platter fragment (SF7457) while 16088 contains a copper-alloy vessel fragment (SF5660) and an array of ironwork including a waste block, double-spiked loop, staple, two strip fragments and eleven nails. Notably, pit 16149 is apparently cut by a smaller feature 16108 (also Group 559) that contains the lower half of a ceramic vessel. Tilted to one side, in the field this was originally thought to be a storage jar oven. However, the greyware jar is too deeply buried and too steeply inclined for use as an oven. Instead, it is more likely placed whole and upright and may even be integral to pit 16149 itself. While a practical use is probable, 'ritual' deposition is not discounted. This pit also contains jet bead SF7366. Circular pit 6151 (Group 552) lies between the two clusters, though does not necessarily differ from them. As well as large quantities of pottery, tile and bone, it contains fourteen hobnails (SF8258) and a jet bead (SF3879). Although presumably filled at different times (some of the southern cluster being slightly inter-cutting), none of these pits is likely to date beyond the end of the 3rd century AD. Pits 6169 and 6873 (Group 546), are sealed by the Group 547 gravel surfacing and may be some of the earlier examples. The latest pits yield pottery that includes B5 and B6 dishes, which are deposited in the second half of the 3rd century AD. 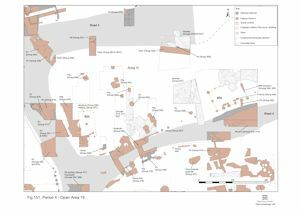 Pit 16088 contains KPG29 dated to c. AD 210-250, pit 6267 contains KPG32 dated to c. AD260-300 and pit 6182 KPG28, dated to c. AD 200/210-230. The remaining features receive material up to the mid-3rd century AD.